Throwback Thursday for this week harkens back to the 1965 National Football League championship game, played on January 2, 1966. It was contested on a sloppy field between two teams that match up on this week’s NFL schedule – the Green Bay Packers and Cleveland Browns. 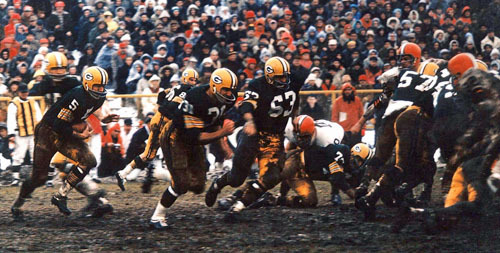 Both franchises were powerhouses at the time, with the Browns returning to the title game after being crowned champs in 1964, and the Packers heading to the championship after winning back-to-back titles in ’61 and ’62. The weather conditions were bad and it didn’t take long for the field to turn into a quagmire, which meant a strong rushing attack would be an advantage in the game. That figured to favor the Browns, who had pro football’s most dynamic back of all time, Jim Brown, lined up in their backfield. Coach Vince Lombardi’s proud Packers, however, were determined to reclaim their glory and had not one, but a pair of future Hall of Famers in their backfield in Paul Hornung and Jim Taylor, not to mention another future HOF inductee in quarterback Bart Starr. Early in the first quarter before the field deteriorated, both teams managed to score through the air, with Starr hitting Carroll Dale on a 47 yard strike and Cleveland’s Frank Ryan countering with a 17 yard scoring toss to the 1964 championship game’s MVP, Gary Collins. The Browns missed the extra point on their score, and with the weather worsening the defenses took over and the teams traded field goals, with Green Bay’s Don Chandler and Cleveland’s Lou Groza both connecting on a pair of three-pointers. The Packers took a slim 13-12 lead into the locker room at halftime, and then took over the game in the second half with a pounding, ball control run game featuring their vaunted power sweep. Hornung, the one-time “Golden Boy” from Notre Dame who was getting up in age, put in a dominant performance in what turned out to be his last shining moment in a Packer uniform. He wound up with 105 yards rushing on 18 carries and pretty much sealed a 23-12 victory for his team on a 13 yard sweep into the end zone in the third quarter. Taylor carried 27 times for another 96 yards as Green Bay amassed 204 yards on the ground in the game, dominating the time of possession. This kept Jim Brown off the field for most of the contest. He churned out 50 yards, but only got 12 carries as Lombardi’s troops kept the ball on long, time-consuming drives most of the day. It was the type of performance that Lombardi loved, and the Pack not only dethroned Cleveland as NFL champs, but went on to beat Dallas in the next 2 NFL championships, following up those wins with victories in the first 2 Super Bowls. It was a fitting swan song for Hornung. He remained with the Packers for the 1966 season but played very little due to injuries, then was left unprotected in the expansion draft the next year and was picked by the fledgling New Orleans Saints in that draft. He never played for them due to all his injuries, but his backfield mate, Taylor, also wound up with the Saints, being traded there by Lombardi when he balked about his salary and threatened to hold out.